Widely regarded as one of the best home-based start up businesses today; thestorknetwork.com®, is now offering a limited number of low cost, work-at-home Business Opportunitys to the general public. By joining thestorknetwork.com®, business owners will be able to secure a protected area, and have a ground floor opportunity with a company that is by far the leader in its industry. Not only are our products superior to anyone in the industry, but our Nationwide marketing campaigns provide many returns on your investment. At thestorknetwork.com our success is largely due to the quality of the products and services we provide. Our Stork Signs are professionally made, and our Trademarked Big Head Baby Sign is recognized nationwide. So, If you're looking for a home based business opportunity thats truly one of the best investments you'll ever make, do your homework, then contact us to talk about an opportunity. 20 Mile Protected Territory or your choice of 20 Zip codes. Individually Designed Brochures, Mailers, Customer Rental agreements, and Business cards (Displayed on this page) using thestorknetwork.com® Logos and customized with your business information. Your Own Custom tagged Web Page on the thestorknetwork.com® web site. 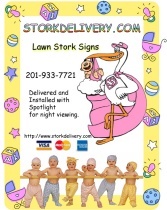 Currently ranked #1 in Google and Yahoo for Stork signs !!!! and a Listing in our Database as the only Retailer in Your Area. Access to our monthly label program that provides you with postcard labels of expecting parents in your area. Your own on-line control panel that allows you to make real time changes to your web site details and accept referrals directly on line !! Note: Partners will be required to sign a Non-Discosure-Non Compete agreement and a Business Opportunity Agreement that says you will conduct your business according to the bylaws of our company. Owning a Business Opportunity means you become part of our organization, and therefore I need to make sure I have the right people doing the job. The Best looking Sign Anywhere !